Who wouldn’t want running shoes with lobsters on them? I’m not from Boston, I don’t ever expect to run the Boston Marathon, and I don’t even eat seafood, but I still love them! But even with their whimsical nature, these shoes might be a bit too practical to fall into the retail therapy category. However, I’m still calling them a frivolous purchase since I didn’t really need them. I saw these shoes for the first time on Facebook and thought they were absolutely adorable, but they didn’t seem like a reasonable investment. The Brooks Launch style don’t have enough support for me to use them for running (I prefer Brooks Adrenaline), and I wasn’t in need of athletic shoes for anything else. But after several days of seeing them all over social media I bought a pair anyway because I decided I couldn’t live without them. They are just so fantastic! I figured I could wear them to the gym so they wouldn’t be a completely silly acquisition. Fortunately they have worked out great in that capacity. I’ve been going to boot camp classes with my running buddy consistently for about six weeks now and I feel great. 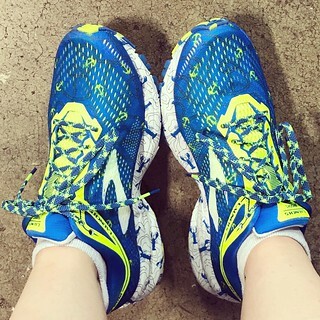 In addition, lacing up these fun shoes three times a week makes getting ready to go to the gym even more fun. It’s amazing what a little exercise can do!